We have a second hand uniform rail in school all items £1 each. All proceeds go to school fund. 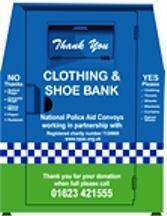 You can help by donating any unwanted clothes or shoes into our clothing bank situated in the footbridge waiting area at School.